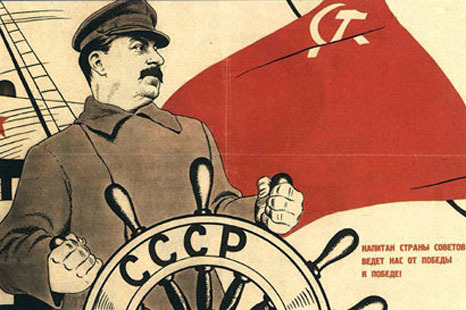 Soviet leader Joseph Stalin at the helm. 1930s Soviet propaganda poster. The Petrov Affair was played out against the background of the Cold War – the rivalry that developed during the second half of the twentieth century between countries espousing different political ideologies. The Soviet Union and its satellite states, often referred to as the Eastern bloc, were on one side. The United States and its allies were on the other, and were usually referred to as the Western bloc. Beginning at the end of World War II in 1945, the Cold War lasted until the collapse of the Soviet Union in the early 1990s. — Professor Manne on the significance of the Petrov Affair. Old Parliament House collection. The Cold War was characterised by mutual distrust and suspicion. At times, Cold War conditions increased the likelihood of a third world war. The United States accused the Soviet Union of seeking to expand their version of Communism throughout the world. The Soviets, meanwhile, charged the United States with practicing imperialism and with attempting to stop revolutionary activity in other countries. superficial young men, whose heads swam with the fumes of communistic wine. Espionage was a very important part of the secret conflict carried out during the Cold War. The Soviet intelligence agency (KGB and its predecessors) was successful in penetrating some sensitive areas of the US and other Western governments. This was usually done with the cooperation of citizens in Western countries or by Soviet diplomats. The Cold War was a time characterised by strongly held convictions regarding the vast ideological chasm between the communist and democratic worlds. In this environment, defectors were often held up as trophies that testified to the bankruptcy of one system and the virtue of another. The Petrovs arrived in Australia in 1951. Under the cover of being Russian diplomats, both were Soviet spies. Petrov’s intelligence role in Australia included decoding intelligence instructions from Moscow, establishing an illegal network of Australian spies, organising surveillance of Soviet citizens and undermining anti-Soviet activities by infiltrating Russian emigre and Soviet refugee groups.